Northrop Grumman Corporation's (NYSE: NOC) Ice, Cloud and Land Elevation spacecraft (ICESat-2), built by the company for NASA, successfully launched aboard a United Launch Alliance (ULA) Delta II rocket from Vandenberg Air Force Base, California. In addition to manufacturing the spacecraft, Northrop Grumman also provided propulsion, key composite structures, a space navigation system and other components on the Delta II launch vehicle. This event marks the final launch of the Delta II rocket. ICESat-2 will provide precise measurements of the changing height of Earth’s glaciers, ice sheets and sea ice. The satellite is carrying the Advanced Topographic Laser Altimeter System (ATLAS), built at NASA’s Goddard Space Flight Center, which will measure the height of a changing Earth one laser pulse at a time. The instrument will enable scientists to measure the topography of the Greenland and Antarctic ice sheets in unprecedented detail. With 10,000 laser pulses per second, the fast-shooting laser technology allows ATLAS to take measurements every 28 inches along the satellite’s path. Northrop Grumman designed and manufactured the ICESat-2 spacecraft at its Gilbert, Arizona, satellite manufacturing facility and will provide mission operations at its Dulles, Virginia, site. 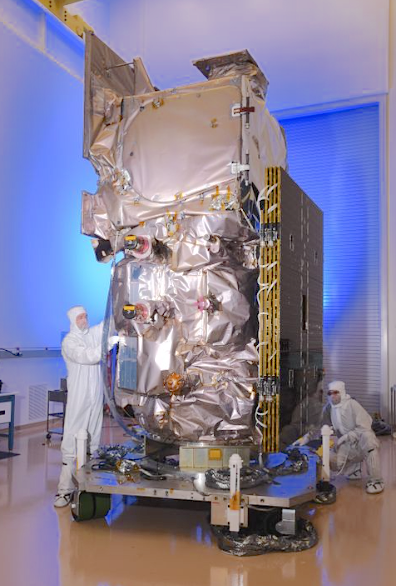 The company built the satellite on its flight-proven LEOStar-3™ platform, which will be also used for the upcoming Landsat-9 and JPSS spacecraft. Company facilities in California and Maryland provided numerous subsystems, including the satellite’s diaphragm propellant tank, pressurant tank, solar arrays and heat pipes for two components on the spacecraft. Northrop Grumman also supplied its Scalable Space Inertial Reference Unit (Scalable SIRU™) navigation system for the satellite to enable spacecraft attitude control and sensor pointing/stabilization. The Scalable SIRU is the industry standard for high-precision, long-life attitude control solutions supporting commercial, government and civil space missions. Northrop Grumman also manufactured the Delta II rocket’s four Graphite Epoxy Motors 40 (GEM 40), which provided an additional 460,000 pounds of maximum thrust during today’s launch. Northrop Grumman has been supplying solid propulsion motors to ULA and its predecessor companies for a variety of launch vehicles since 1964 and is ULA’s largest legacy supplier of solid propulsion. Northrop Grumman manufactured the GEM 40 motors in Utah, the Delta II rocket’s 10-foot diameter composite fairing in Mississippi and the rocket’s second stage helium and nitrogen pressurization bottles in California.